There are a variety of ways to get the booking engine to match your website design, by far the simplest to use are the inbuilt colour selections and banner uploads. If you have colour codes you can enter them directly, alternatively click the small multicoloured icon and the colour picker shown in the screenshot above will appear. If you want to match the exact colours of your website but don't have the colour codes there are third party applications that will let you "pick" the colours out of your existing website, one great example is the colorzilla add-in for the Firefox web browser. Further down on the Design look & feel page is the Top banner image field, this will let you upload a banner image that goes along the top of every page of your booking engine. 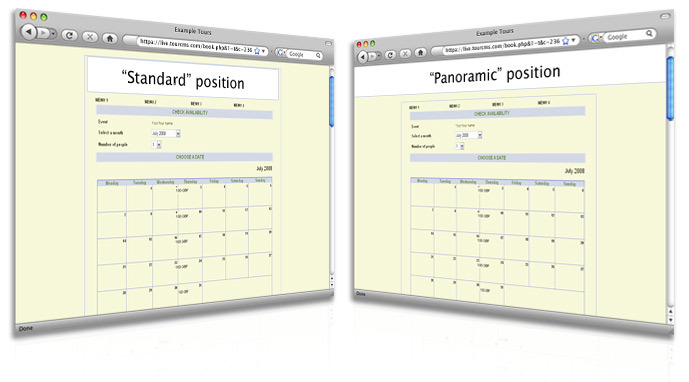 In addition to the change in location the "Panoramic" banner also repeats to fill the available browser width, the "Standard" banner is only displayed once on each step. Web designers & developers can go further by adding custom HTML & CSS to the booking engine to replicate website designs, navigation etc.